It is a sad day here at Channel 3 as we’ve learned of the passing of a member of our family, Charlie Bagley. He died yesterday at his home in Stafford Springs at the age of 82. Charlie was a fixture for 23 years here at WFSB, dating back to when our call letters were WTIC. He worked closely at Broadcast House on WTIC radio with the legendary Bob Steele. I had the pleasure of anchoring with him on Eyewitness News Daybreak for about a year in the mid-90s before his retirement. Here’s a historical footnote about the man known as “Fair Weather Charlie:” he hired Bruce DePrest. The viewers loved Charley, and he loved his job. He returned to Channel 3 a few times over the years for a going away party for Gayle King, and to celebrate the station’s 50th anniversary. We’ll have more on the death of Charlie Bagley tonight on Eyewitness News at 6.
rip he was a great person!!! Wow! What a blast from the past. No doppler radar back then either. R.I.P. Charlie. RIP Charlie Bagley. We share a last name although we are not related. Sad news indeed. I remember finding out about many a blizzard watching Charlie. He will be missed! I met him several times in the course of duties at my job. A really nice person! You will be missed! I am sure he will be missed but remembered by a lot of people. Sincere condolences to his family & friends. I’m so sorry to hear that. I probably watched him for all 23 years. He is missed! R.I.P. Charlie. He was a great man and will be missed. RIP Charlie, one of old favorites. I had the privilege of knowing Charile when we still lived in Stafford…my youngest daughter & his granddaughter were little friends in grade school. He was wonderful with the kids and paid me such a kind compliment one day when he told me how pleased he was to have my little girl go places with them because she was so kind, well-behaved and respectful. He was quite the gentleman & I will always remember him fondly. Sincerest condolences to his family. One of the best!!! RIP Charlie you will always be remembered!!!! Charlie was the best person and volunteer at JMH..he will be dearly missed hearing his voice over the loud speaker “nurse to the nerve station” i loved being one of Charlies Angels…. He was a regular guy, humorous with whatever he said and made you WANT to watch his broadcasts every night! R.I.P. Charlie You were a great man. I will never forget when I wrote you a letter about my parents on their Anniversary. You wrote back to them wishing them a Happy Anniversary. God is sure getting one of the best weathermen there is. God Bless! I am truly sadden by the new of the passing of mr bagley. I will miss him alot he made me laugh and smile as I greww up with him as a child and now as an adult it shows me how old I am getting . I will see you up there charlie . My prayers to his family. R.I.P. Charlie. We were half of a year long lunch-hour bridge group in 1962, so we go back way before his WTIC tenure. A great character. 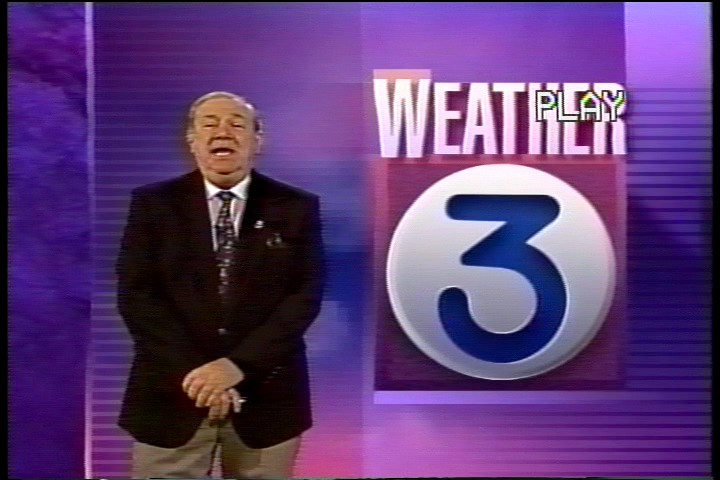 Charlie was an icon in the weather world in CT. One of the all time greats. He will always be remembered for his quick wit and demeanor. One of those great peronalities that you grow up watching that become like part of the family. He will be missed by many. Thanks Charlie! You were a real legend Charlie and will be greatly missed. Today is my birthday and the day you went to Heaven. I remember bumping into Charlie at Johnson Memorial Hospital in Stafford where he volunteered. It was like talking to an old friend. It was obvious that he loved his job there and loved meeting people. So sad to read about his passing. But if there’s a weatherman’s job opening in Heaven…by golly…he got it!!! How sorry to hear of Charlie’s passing, he lived in my home time and had seen him many time at Johnson Memorial Hospital volunteering his time. My condolences to Charlie Bagley’s family and friends, his meteorological family and his friends at WTIC-TV and WFSB-TV television stations and WTIC radio. I’m old enough to remember Charlie’s broadcasts and even the pioneering meteorologist Barbara Allen. Bruce DePrest must be proud to be a more recent link to that era and saddened at the loss of a friend and mentor. It is clear that Charlie was beloved as a humorous and informative meteorologist, a volunteer generous with his time at Johnson Memorial Hospital, a loving grandparent and a good friend. What an irreplaceable treasure! Rest in peace. You will be greatly missed and remembered fondly. I was a fellow empoyee with Charlie of the Travelers Research Center 1968-1970. He was a great guy to be around; he had a terrific sense of humor. Around then my 9-10 year old son was fascinated by meteorology and the on-air weather features. I asked Charlie if he could give Doug a tour of the Travelers Weather Service to encourage his interest. Charlie rolled out the red carpet for Doug. I think he showed him every instrument, told him how all this stuff worked and how he put a forecast together. I think he spent about an hour and a half with him, answered every question and had Doug swearing that he would become a TV weatherman and that he would be a Charlie Bagley fan forever. Doug ended up at MIT and chose Chemical Engineering over Meteorology. He still remembers Charlie’s kindness to him. Charlie was a very good on the weather. When he was on he made jokes. I want to leave my deepest condolences to Charlie Bagley’s family!! RIP Charlie!! Charles Bagley was the ( Bob Steele) of weathermen…. Rest in peace. You made earth a better place. An intriguing discussion is worth comment. There’s no doubt that that you ought to publish more about this subject matter, it might not be a taboo subject but typically people don’t discuss such topics. To the next! Cheers!! When I was a senior in high school in 1985 I met with Charley to ask him about a career in meteorology. He spent a half hour with me showing me around the office and answering my questions. My father respected him highly when they worked in the Air National Guard together. RIP Charlie. If you could email me with some hints & tips about how you made your blog site look this cool, Id be appreciative!